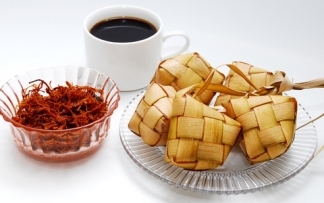 Ketupat is compressed boiled rice packets. The woven containers can you buy it at the market in Indonesia, they are plenty especially when the Ramadan begin. You don’t have to make it by yourself although make the container is not so difficult. But outside Southeast Asia is hard to find this container. But you can find ready to make lontong at the Chinese supermarket. The rice is already filled it in the plastic bag. You just have to cook it in the boiled water. It's simple and easy solution and the taste is not very different. Wash the rice several times and drain and add some salt. Mix it until well. Fill the containers 1/3 full and put them in a saucepan. Fill the pan with water to cover all the ketupat. Boil it about 5 hours. Add more water if needed. Hard to find ketupat or lontong? Try this online Ketupat Nasi ( Rice cubes ) product. It’s not the same as you can provide in Indonesia itself but it’s worth to try. One thing I have learned in Europe that you can make the dish very tasteful just like in Indonesia as long as you dare it to try and not to give up. The ingredients is hard to find but everything can be substitute, right?